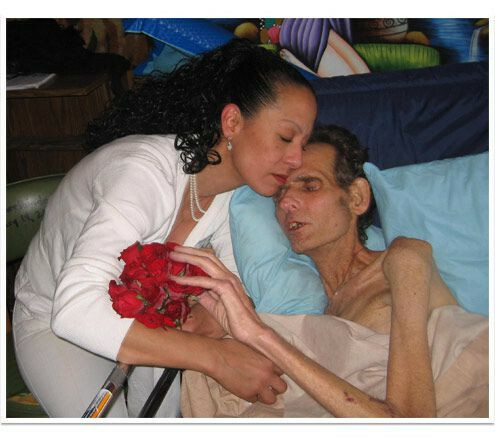 Hospice is a journey of love and compassionate care. It’s not a solitary journey – many lives are touched by the hospice experience. Every day, we’re inspired by the courage of our patients and their families, as well as the selflessness of the caregivers who lovingly support them. We offer this space to those brave individuals who have graciously shared their personal stories of the emotional and spiritual healing they received as a result of choosing hospice care. We invite you to tell us, "What has been your most memorable means of support during your journey of grief?" Whether it was the hospice nurse who went beyond the call of duty, the book that a hospice volunteer gave you, or your chaplain who went the extra mile to help you with creating a meaningful celebration of life service, a meaningful DVD tribute and webpage. These real-life accounts may serve to provide others with new ideas and needed inspiration. If you would like to share your hospice experience, please contact us. Student volunteers are an important part of the hospice interdisciplinary team. These special teens find it personally gratifying, intellectually stimulating, and emotionally meaningful to assist those in need at a critical point in their lives. Sachira is one such ambitious teen. He is seen here arranging flowers for our “Petals for Patients” program. Mothers also find it important to break away from their demanding schedules and spend quality time investing in the emotional support of patients and families facing the challenges of terminal illness. Rita, Lucy and Blanca are three amazing moms who make the time to "be at one with the flowers". Each of them have confessed that personal gratification is what drives them to spend countless hours picking up, cleaning, arranging and delivering fresh flowers to lift the spirits of others. They regularly pursue the grand prize bestowing joy to others through the gift of beautiful fresh flower bouquets. These ladies are a true inspiration for all moms who have a heart to serve! When Jackie Phillips lost her mother Billie Stucker August 6, 2011, and her death was very difficult for Jackie as they had been very close. 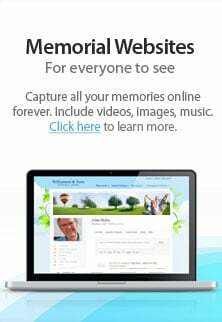 Chaplain Roger Rustad built the family a webpage and made a special memorial tribute DVD on life of Billie Stucker that they could watch at home or online any time. Jackie even had a special memorial service for her mother and the tribute DVD was certainly a highlight of the memorial service and the friends and family commented how much it helped them heal through sharing the special memories. Jackie started her bereavement journey but the heartache and pain was still there. She thought about her mother Billie every day. 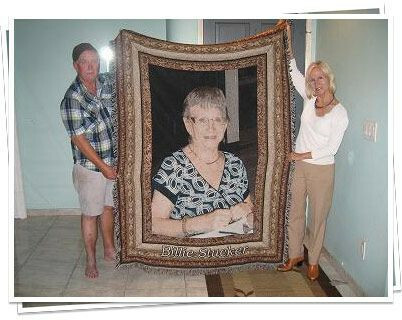 Some months later, Chaplain Roger Rustad had an idea and had a special Tribute Blanket made and brought it to Jackie and her husband Mike. They were both thrilled and Jackie said, “Is just like bringing my mother back to life and I want to cuddle up with it every day. Flowers die but this will be forever.” Mike was also thrilled and commented several times how he wished that his mother-in-law Billie could have seen the blanket before she died. Shangrila Hospice creates these special tribute tapestry blankets out of caring respect for our patients and families that we serve. We consider it a privilege to serve your loved ones in their last days and make their final days as comfortable as they can be. We hope that in some small way that these blankets lessen the pain of our loss and will bring smiles instead of tears. There are over 8 miles of thread that goes into each blanket. Chaplain Roger Rustad says, “Our life can be thought of as a tapestry, with all of our relationships and experiences woven together to make that which is “us”. The image of your loved one is woven together with 6 individual colors; green, blue, red, gold, black and white. When we are young, we are like the green thread, learning as we go through life experiences. Later, the blue sky fills our lives. In our prime, we progress and grow like the red thread and then we enter into the golden years. In the end, the darkness gives way to the light during the final part of our journey." Jose Arenas Jr had been a long time New York Yankees fan but he knew that because of his health, the dream of attending one last New York Yankee's baseball game at the Yankee Stadium would never be a reality. 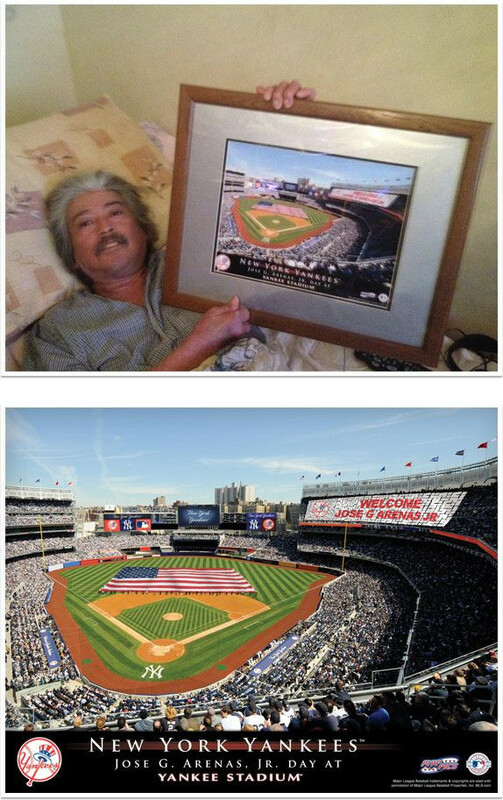 Shangrila Hospice Chaplain Linda Penick knew that his family was coming to visit Jose and so she had a special New York Yankees stadium Appreciation Day photo made for Jose to present to him on that special day. Providing Shangrila Hospice patients with special Personalized Memorial Art is just another way that Shangrila Hospice fulfills their mission of "Enhancing the Quality of Life" for each of their patients. Charles Seelbinder had wanted to marry his sweetheart Cynthia but so many things happened in his life that delayed their wedding. Charles was injured severely at work when a forklift crushed his legs. Soon after that, he was diagnosed with cancer. When Charles was placed on Shangrila Hospice he met Chaplain Roger Rustad, and told him of his desire to marry his fiancée Cynthia before he died. His doctor had told him that he did not have long to live. The chaplain was able to get a mobile notary to come to their house, as he was too weak to leave their home. The obtained their license and asked Chaplain Roger Rustad to have the bedside wedding. 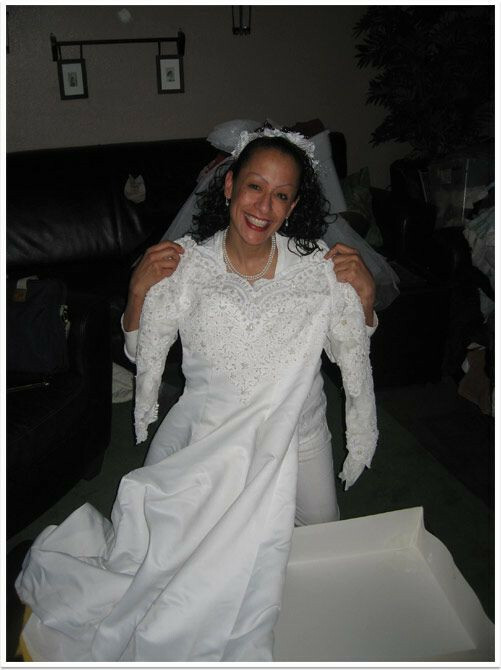 Chaplain Roger placed some calls and with the help of the Shangrila Hospice Volunteer Coordinator Jamie Slade, Cynthia was able to borrow a beautiful wedding dress. Chaplain Roger asked them where they would have liked to go for a honeymoon if Charles had been able to go and they both responded "Italy" in unison. Jamie was able to have a special Italian dinner brought to them and got travel DVD's on Italy and a special movie with an Italian theme. She even got a special cake and red roses for their wedding. Chaplain Roger Rustad had the bedside marriage ceremony and through labored breaths, Charlie was able to say, "I do." Charlie said, "This is the happiest day of my life." Charles passed away a couple months later with his bride Cynthia and Chaplain Roger at his side. Cynthia said, "Charlie and I were happy and that was the most important thing and now he is at peace." Chaplain Roger Rustad said, "It was not the most romantic place in the world for a wedding, but the looks of happiness on their faces is something that I will never forget." Shangrila Hospice specializes in providing the best hospice care possible, and making our patient's last days, the best they can be.